Event organizers reported that 6,300 in attendance [at the AT&T Stadium gathering] responded to the Gospel invitation issued by Laurie. Additionally, more than 18,000 professions of faith were made at host locations and 1,042 more were made through the online webcast, bringing the total number of professions of faith to more than 25,000. Sounds great, right? Maybe not. While Southern Baptists of Texas Convention were supportive of Laurie’s crusade, by providing counselors for the event and simulcasting it in churches around the state, there is much about Laurie that is decidedly outside the traditional beliefs of Southern Baptists. Yet, on the heels of such attention-grabbing headlines, The Christian Index, the newspaper of the Georgia Baptist Convention, reported on March 9 that Laurie will take his crusade to Atlanta in September 2016 and Arizona as part of the SBC Crossover in 2017. Baptists are embracing this. But should we? We are too apt to rest in a bare profession of faith, and to think that this will save us; it is a cheap and easy religion to say, ‘We believe in the articles of the Christian faith’, but it is a great delusion to imagine that this is enough to bring us to heaven. It appears that Laurie likewise does not recognize a profession of faith as authentic evidence of possession of faith. But for Laurie, it’s not because the guideline of authentication that Scripture actually implies–evidence of sanctification. According to the Statement of Faith on Harvest.Org, Laurie rightly includes “water baptism” as a scriptural practice. While confirming that water baptism is not salvific, Laurie’s “What We Believe” page features an element of faith conspicuously missing from the Baptist Faith And Message: “Baptism of the Holy Spirit”. Folks, we’re now entering TBN fantasy land here. Please fasten the seat belts on your pews. Usher in the charismatics, please. Someone queue up the fog machine! Get ready the tambourines, pew hopping, gibberish utterances, word of faith, the whole shebang! Come get an anointing! Other than prescribed church offices, exactly where does Scripture teach the believer must be further qualified for Christian service? Where is the baptism of the Holy Spirit prescribed? To say that you get the Holy Spirit later, after salvation because the apostles did is to misunderstand the redemptive history of God. The Spirit came here (at Pentecost) because this was the time for the Spirit to come. And there had to be a beginning. It is not to say that this is the example of every Christian who then gets the Spirit X number of years after his salvation. Not at all. It’s incredible when someone, by God’s grace, is authentically saved. Baptism is a wonderful testimony to the continuing truth of Jesus’ mission and the promises of His Word. But to go beyond that Word, and suggest such a clearly false teaching as extra baptisms, is not merely a slight theological difference. It is violence to God’s Word to proclaim anything other than “one Lord, one faith, one baptism”. There seems to be a battle in the SBC, will its acronym come to mean “Slowly Becoming Catholic”, as Russell Moore might prefer, or will it mean “Surely Becoming Charismatic?” Whichever result wins, it wins at the disregard of Scripture. Baptists who should decry this, though, are settling in with Laurie, and his addition to Scripture. 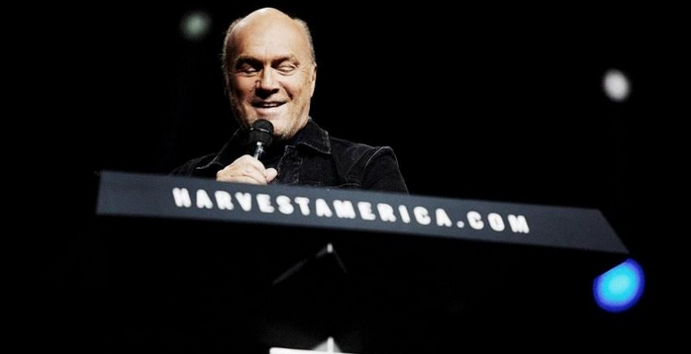 Greg Laurie will be a featured speaker at the 2016 SBC Pastors’ Conference. Next thing you know, we’ll look in the Baptist Press and find the Lottie Moon offering replaced with a collection to buy Creflo a jet! It’s what happens when you disregard Scripture. And that’s just what the SBC is doing. About our acronym? One thing is evident, “S.B.C.” doesn’t mean “Solidly Biblically-Centered”. And that … that is a shame.